It happens to everyone at some point. You are out and about and it creeps up on you… the need to go to the toilet! At first you are fine…. just pop to one more shop perhaps? But there is a bit of a queue at the till and once you are done paying, you search for the nearest toilet, which is out of order! You are waddling down the high street, feeling as though you are about to explode… when finally… you find it… and … RELIEF!! But of course this doesn’t happen to everyone. Or, at least, it happens in different ways for many people. For ostomates, (people who have colostomies or ileostomies where the contents of their bowel are diverted to a bag) the need to go for a poo is different. For ostomates the need for a poo is never desperate – their colostomy bag is there, fitted at all times to catch their waste as it leaves their bodies. However, ostomates can often find themselves desperately trying to find a toilet. Firstly, a colostomy bag fills up over the course of a day and needs to be emptied. It doesn’t take much imagination to understand what could happen if it is not emptied regularly. Just as bowel habits differ for people who don’t have colostomies, the bowel habits of ostomates differ too. This can mean needing to find a toilet quickly, or at least knowing that there is a toilet nearby should it be needed. Secondly, colostomy bags can leak. Leaks don’t happen all the time and there are things that can be done to minimise them, but they still happen. Even if a leak is slight and no-one else would know, an ostomate needs to find a public toilet quickly, to empty the bag, clean up and refit. Therefore plentiful public loos are a must if you are an ostomate. Unfortunately, for an ostomate, finding a toilet is only half the battle. Once a toilet has been found, is it equipped to meet their needs? When a non-ostomate finds the toilet they hope for a lockable door and some toilet paper. This is not always a given, but tissues and a hand pressed up against the cubicle door can do the job in desperate situations. Because ostomates poo differently they have different requirements. Firstly, clothes can be a hindrance. Depending on the site of the stoma a few items of clothing will often need to come off completely. Wet or grubby floors in public toilets are more common than rainy days in British summertime, and no one wants to remove their clothing and place it in a pool of who-knows-what when they empty their colostomy bag. A couple of handy hooks can easily solve this problem. It’s not just somewhere for clothes that is required either. There are lot of things to carry when you are an ostomate. If you are emptying your bag and wiping your stoma, you need somewhere for your wipes and your colostomy bag, and it needs to be clean. A clean shelf is a must. The last thing many ostomates want to do, is emerge from the toilet, clean and fresh, but carrying the old colostomy bag because there was nowhere to dispose of it in the cubicle. People generally want what happens in the toilet to stay in the toilet – why would an ostomate be any different? A suitable bin is always necessary. It can also make the process of changing bags much easier if there is a mirror available, so ostomates can see their stoma. 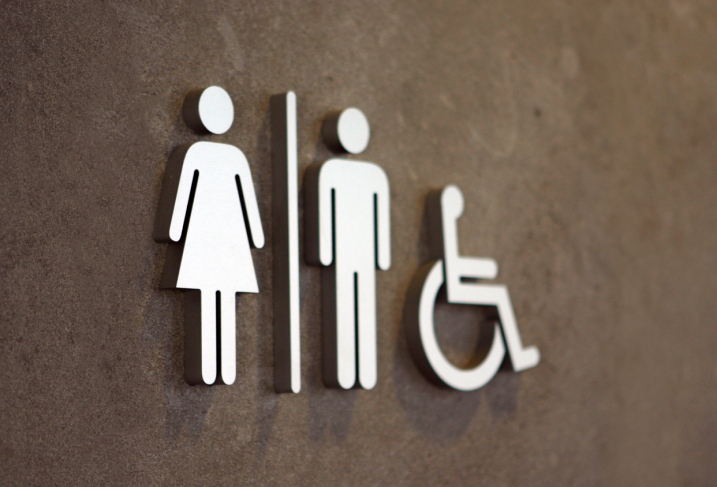 Many of the above requirements come as standard in disabled toilets, but ostomates can feel embarrassed and face hostility, when walking out of a wheelchair accessible toilet to find a wheelchair-user waiting outside. Awareness and proper signage advising that the accessible toilet is for ostomates can make a real difference and make ostomates feel more comfortable accessing the toilet they require. I am not an ostomate, but my experience of people who have become ostomates through the negligence of hospitals and doctors has shown me that for most people (and it really could happen to any of us) there is a difficult period of adjustment. To begin with people feel like life will never be the same again and the normality they used to enjoy is cut off from them forever. People do not feel confident to leave the house, sometimes for fear of accidents, but at other times, just for fear of getting noticed. By ensuring that public toilets comply with the relatively simple requirements set out by the colostomy association, the transition can be made easier for new ostomates making everyday life easier and less stressful. Everyone can identify with needing the toilet – ostomates’ requirements differ but that doesn’t mean that they shouldn’t be met. I am a Solicitor at Bolt Burdon Kemp specialising in medical negligence claims. If you or a loved one would like to discuss medical care received that led to colostomy or ileostomy, you can contact me free of charge and in confidence on 0207 288 4840 or at tomlax@boltburdonkemp.co.uk for specialist legal advice. Alternatively, you can complete this form and one of the solicitors in the Medical Negligence Team will contact you. You can find out more about me and the Medical Negligence Team. How can technology help people who have suffered a brain injury?